When thinking of industrial espionage the mind tends to drift toward things like advanced weapons systems, high tech gadgetry, heavy equipment, and even arts and entertainment. But horse head squirrel feeders? According to David Wahl, director of awesome at novelty toy titan Archie McPhee, absolutely. “There is industrial espionage in the novelty squirrel head feeder industry,” Wahl recently told the Washington Post. So what do Wahl and Team McPhee do to combat the tactics of rivals like Harold von Braunhut, Honor House and Mainway Novelties who will seemingly stop at nothing to gain an edge in the cutthroat world of fake vomit, joy buzzers and onion gum? Create products so iconic that connoisseurs will want nothing less than the original, even if it means paying top dollar. Monolo Blixa shoes for $5,000? Run, don’t walk to the store. A Louis Vuitton Minaudiere Petit Tresor handbag for $8,800? Where’s my wallet. An Ellipsocurvex Tourbillon watch for $129,000? Time to spend a little coin. 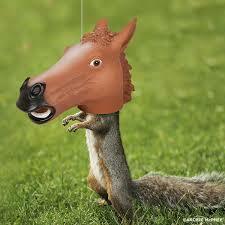 An Archie McPhee Horse Head Squirrel Feeder for $15? Peanuts. Okay, so maybe Wahl had his tongue in his cheek when he cracked wise about the dangers of peddling squirrel feeders, bacon body wash and bigfoot sweaters, but industrial espionage is no laughing matter. In fact, the FBI recently issued a warning to technology startups to be wary of Russian investors who may be more interested in pilfering intellectual property for shipment back to the motherland than in helping build the next big Silicon Valley or Boston-area success story. In recent weeks we’ve highlighted stories of IP theft involving flash memory technology, Oreo cookie stuff whitener, tribal knowledge, and corn seeds. The message is clear: if there’s a dollar to be made with your novel idea or invention, there’s someone out there who will do what they can to steal it from you. Do what you can to safeguard your information, including obtaining legal protection and advice and investing in both physical and digital protections that can keep your crown jewels out of reach.